We stopped by the M Room to see a friend’s band. 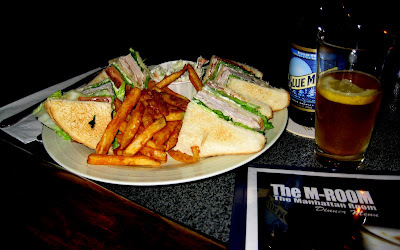 The band’s not worth writing about, but the club sandwich is! I’d already eaten, but K was starving. While waiting for a menu, she saw someone else’s uneaten turkey club and it looked so good, she had to have it. And sure, she was absolutely famished, and maybe that’s why she loved it so much, but even after her starvation wore off, she still liked it. It was a very good club sandwich. I did eat a bunch of the fries, and I totally loved these fries. Seasoned fries, crispy, not greasy. I’m a fan of these. They have a pretty big and extensive menu, as well as daily specials. If I ever go back there, I’ll be sure to eat a proper meal. Our bartender was really nice. It was his last night working there as he is getting ready to sell his soul and go back to the law degree that he never took advantage of. So a couple of years from now, if you ever meet a heavily tattooed lawyer who looks like a german soldier from WWII, then it might be him.